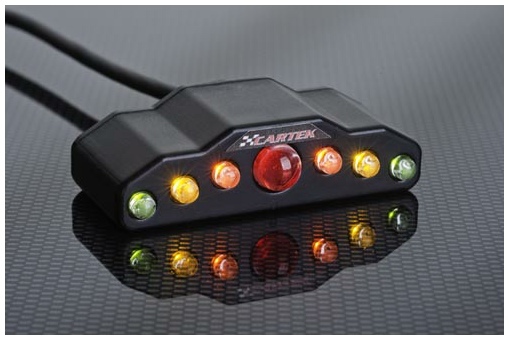 The Sequential Shift Light from CARTEK indicates to drivers the preferred time to shift up gear to gain maximum performance from their engine. This fully integrated device is designed to be mounted onto the dashboard and works with most ignition systems and tacho signals. The unit is quickly and easily programmed and requires just 3 electrical connections. 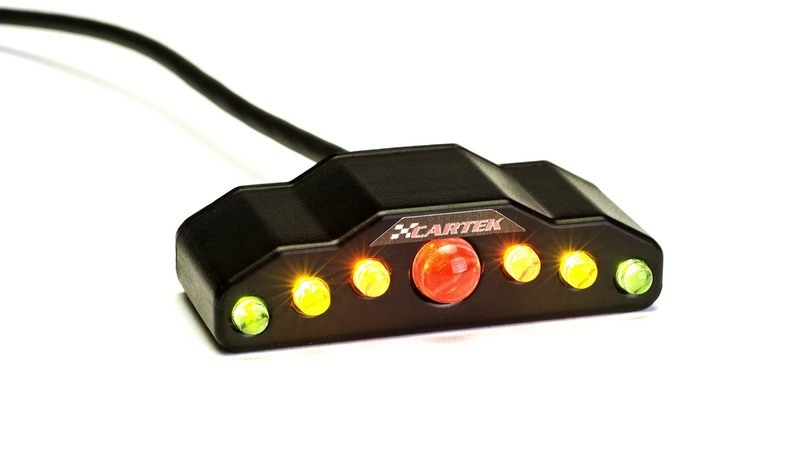 The CARTEK Shift Light takes in an RPM Signal, 12V Power, and Ground. An extra white wire is used to put the unit into setup mode. This is achieved by touching the setup wire to chassis earth, and then start the engine. Two outer green LED’s will begin to flash – this will only happen in setup mode. First you store the lower RPM of the sequence. To do this raise the revs to your starting point and then immediately reduce the revs. The Shift Lights will have stored the RPM that you want to start at. Then touch the setup wire to chassis earth, and then raise your revs to the highest point you want the Shift Lights to finish at. Immediately reduce the revs again and the Shift Lights will have stored the highest RPM. Touch the setup wire to chassis earth to finish the setup mode. It will calculate all intermediate LED levels of the sequence and will be ready to use.